We think the Smart Si is great overall and award it 4 out of 5 stars. To earn a higher rating, we’d have wanted to see a no-C-wire workaround included in the box rather than sold separately, and maybe a larger screen since there’s quite a bit of faceplate area going to waste. That’s just getting nitpicky though – read on to see why the Smart Si is one of our favorites. A lot of people discover the ecobee Smart Si after having trouble with the Nest. Either the Nest struggles to stay connected, or can’t handle their dual fuel system as adequately as they’d like, or can’t get Nest working with their C-wire. But the Smart Si isn’t an “also ran” consolation prize, it’s a full-featured smart thermostat with all the goodies you’d expect, and none of the cruft you pay $100+ more for on competitor products. With an average rating of 4.5 stars out of 5 on Amazon.com, we feel the Smart Si is a worthy competitor to the Lyric and Nest. The Smart Si lacks a touch screen, but there’s still plenty of information on the screen, including weather and HVAC system settings. The screen and buttons are back lit, too. We call the Smart Si a “budget thermostat”, but there really aren’t many sacrifices here. If you really, really want a shiny yo-yo for your wall, by all means, go ahead and get a Nest or a Lyric. But that’s about all the extra $100 buys you! 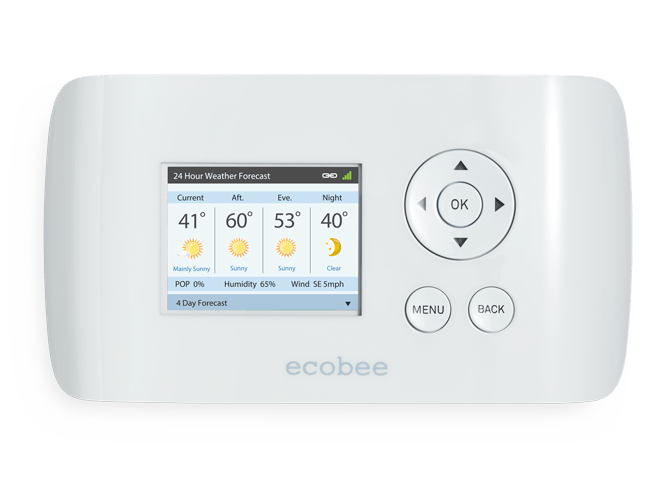 The Smart Si is a remotely accessible and configurable thermostat that looks like, well, a thermostat. The Smart Si doesn’t feature a touch screen, but you can still do all the usual thermostat stuff via the buttons at right. The companion app and web portal are fully featured and it’s just easier to sit down at a computer or phone and make changes there. 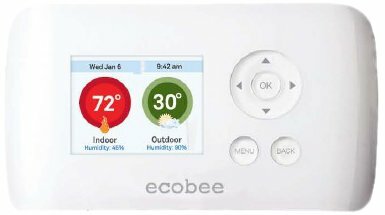 Most WiFi-enabled thermostats run anywhere from $200-250 a piece, and some models (like the Honeywell Lyric) don’t even generate usage reports or give you as much control over your system’s settings and send you alerts when your home’s temp goes outside your desired range (Nest can’t do either of those). One caveat: Like other smart thermostats, the Smart Si requires a C-wire. 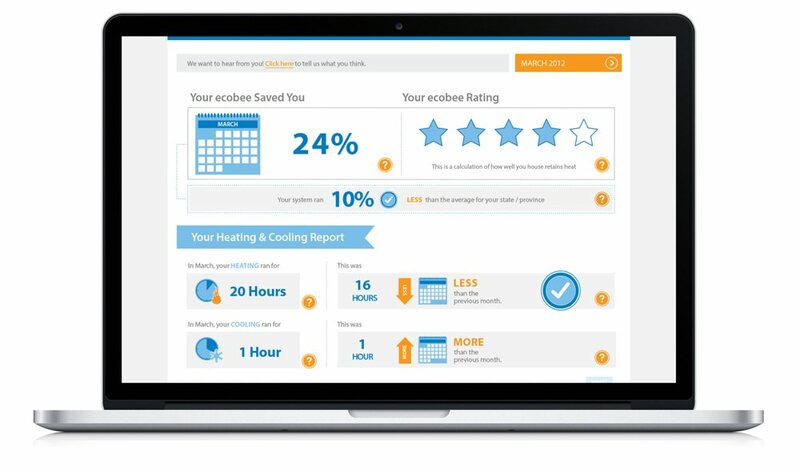 If your system lacks a C-wire (and it’s good to figure this out before surprising someone with a smart thermostat of any brand), you’ll need to buy a Power Extender Kit from ecobee (Amazon.com link) or a Venstar Add-a-Wire adapter. 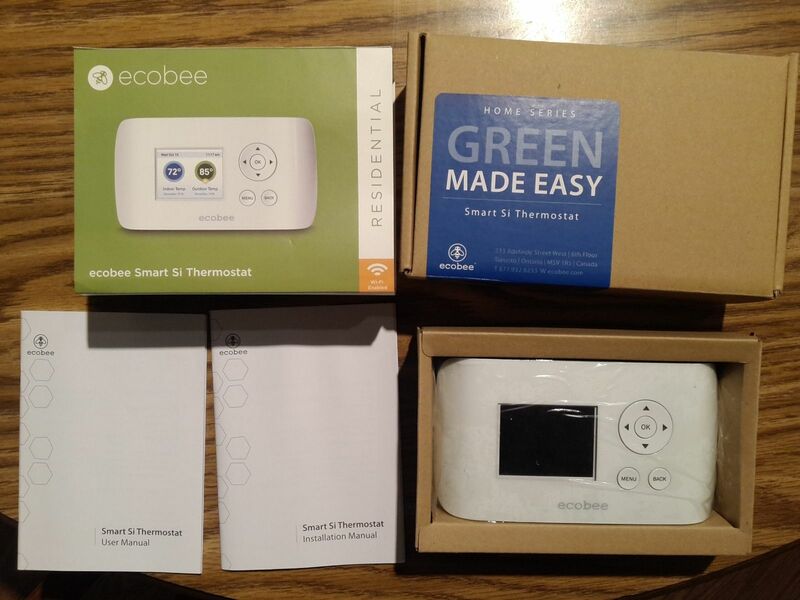 ecobee Smart Si unboxed – note the Power Extender Kit is NOT included with a Smart Si (it is, however, included with the ecobee3). 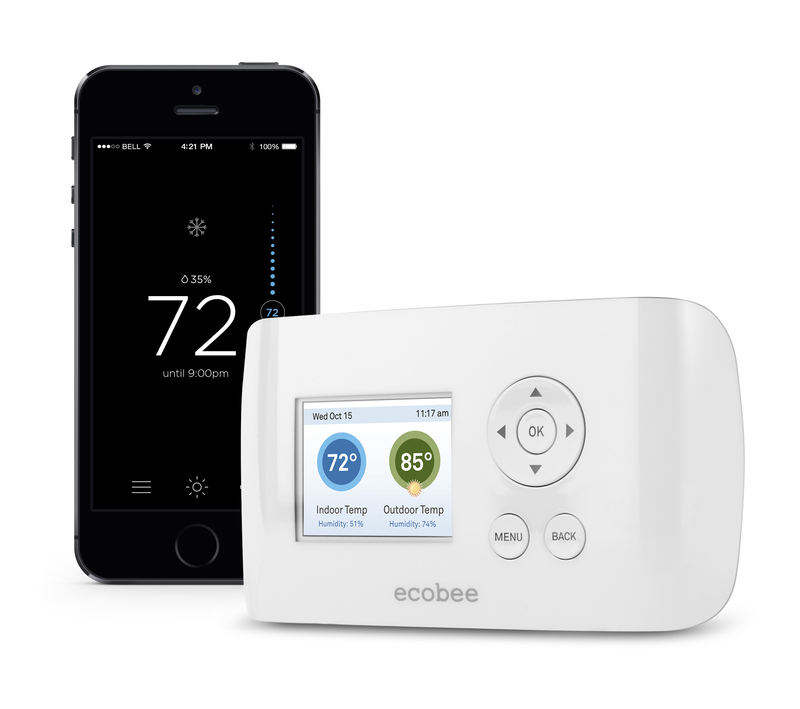 The ecobee Smart Si is a fantastic device that gives you exactly what you want out of a smart thermostat: complete control over your HVAC system and remote access to all its settings. Even though it costs a good $100 less than its major competitors Lyric and Nest, the Smart Si manages to pack in more features. The Smart Si is a smart choice for your home! We have one and wish it won’t break because if it does good luck trying to get help! I have been getting replies with try this and try that on the fluctuation of the temperature. I have tried everything but the last one stating that it is sensitive to the temperature being by the return air and to close the return air vent off. Really?!? No solution and it’s been 4 days of going back and forth. This is not cost efficient. It rarely cools to what it is set to and then bounces up and down on what the internal temp shows.